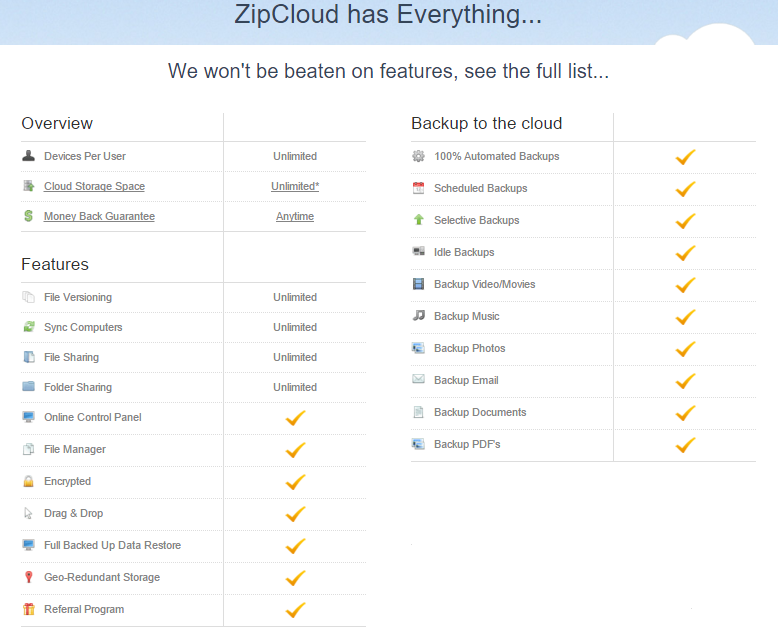 ZipCloud review from BestBackups, including an in-depth look at its features, security measures, customer service and value for money. Much like its sister site MyPCBackup, ZipCloud is user-friendly and has plenty of great features – although extra charges are excessive in places, placing it at the very top of the average price range for Cloud storage. You can read our review below or sign up now. For full details of what you’ll be getting from all of these backup services, head over to our MyPCBackup review, which contains a detailed explanation of everything they’ve got to offer. Alternatively, read on for an overview of ZipCloud’s most important features. Unfortunately, ZipCloud’s website doesn’t display prices in USD so, to save you the trouble, we’ve converted them for you. Please note that these may change slightly depending on exchange rates at your time of purchase. ZipCloud offers an initial subscription with 1GB of storage space and a 15MB Sync Folder. You can increase this by 250MB by completing simple tasks. Although ZipCloud technically allows you to cancel your account at any time, in reality it’s not quite that simple. If you terminate a paid subscription within 30 days of purchase, you’ll get your money back – no questions asked. However, if you want to bring things to a close any time after that, you’ll need to pay a termination fee of $14.95. Automatic Video Backup – $14.95. Additional licenses for $29.95 each. Supercharged Backups (for improved processing speed and general performance) – $24.95. Network Drive Support – 99.95. Previous Versions (all file versions from the past 30 days) – $24.95. Previous Versions Plus (unlimited version history) – $49.95. As with standard subscriptions, all charges are subject to VAT at your local rate. Keep reading for more information on how the add-ons work and when they might come in most useful. ZipCloud accepts payment using PayPal, American Express, Visa and MasterCard. How does ZipCloud compare to the competition? ZipCloud uses a different pricing model to many backup and online storage providers, most of which only charge a single monthly fee that covers all features as well as your storage space allowance. Although we appreciate the idea of being able to effectively build your own subscription with only the features you want, charging for them all independently drives ZipCloud’s prices up significantly. If you only want a few added extras, then you’ll still be within the average price range of most other providers – if you want the whole lot, however, you’ll be paying significantly over the odds. ZipCloud is owned by UK-based company JDI Backup Ltd, which is in turn a subsidiary of Just Develop It – a large conglomerate that develops products and invests in areas as diverse as childrenswear, restaurants and real estate. Founded in 2007, JDI is headed by current CEO Chris Phillips – a serial investor and entrepreneur with a net worth currently estimated at around $82 million. Manual, automatic and scheduled backups. Schedule by choosing a month and date, or choose specific times by purchasing the Hourly Backups add-on. Maximum file sizes of 1GB, or 5MB for trial users. Videos only available for manual upload – include in automatic and scheduled backups by purchasing the Automatic Video Backup add-on. Which operating systems is ZipCloud compatible with? Send personal invitations to view or edit files. Deny access at any time. Single, transferrable, backup license. You can also purchase extra licenses by buying the Additional License add-on. Synchronise files between multiple devices by using Sync folders. 1GB allowance is provided as default, or increase this to 5GB, 10GB or 20GB by purchasing Sync Folder add-ons. Upload and sync from unlimited mobile devices. 7 most recent file versions available to standard account holders – extend to access all versions from the past 30 days, or get unlimited access by purchasing the Previous Versions or Previous Versions Plus add-ons. Saved files are immediately removed after deletion – retain for 30 days with the Recycle Bin add-on. Option to cap CPU usage for better PC performance during backups. Schedule backups for the most convenient times. Option to backup only while computer is in sleep mode. Buy Supercharged Backups add-on for faster transfers and better performance. Manually backup from network drives with a standard account. Buy the Network Drive Support add-on to automate the process. Although ZipCloud’s encryption isn’t end-to-end, they do support uploads of pre-encrypted files, so if you want to use their software but are concerned about privacy, you can take matters into your own hands. Whether accessing your account online or using the desktop app, ZipCloud, MyPCBackup, BackupGenie and JustCloud all operate in exactly the same way. You’ll even find that, once you’ve got an account with one of JDI Backup’s providers, you can use those account details to login from any of their websites. For example, logging into ZipCloud using details from your MyPCBackup account will take you to the MyPCBackup dashboard, rather than a ZipCloud one. 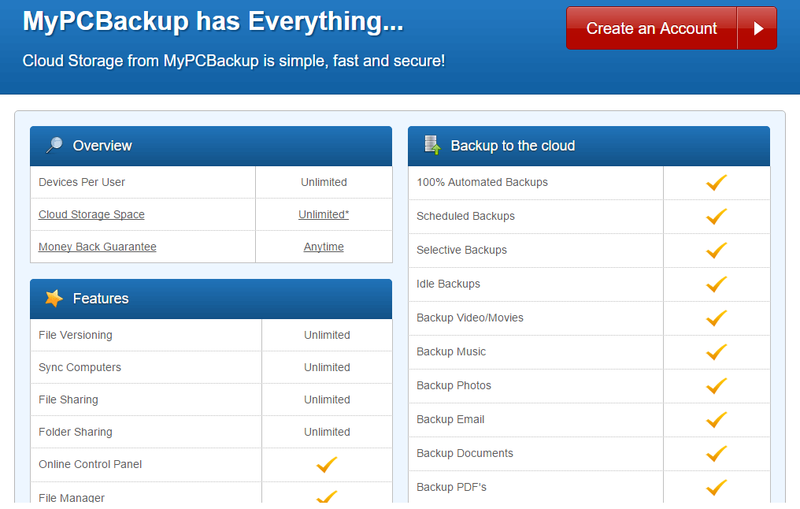 Head over to our MyPCBackup review for more details. ZipCloud has a lot of strengths – most notably when it comes to its features, which are extensive, well-developed and easy to use. However, it still struggles against the competition – primarily due to a pricing plan that charges extra for every additional service, and a website that fails to adequately explain how much a subscription is really going to cost you. If you’re looking for great value, then, ZipCloud might not be the best place to start. However, If money’s not an object or you’re happy with a basic set of features, then ZipCloud definitely merits a closer look. What are your thoughts on ZipCloud? Leave us a comment and let us know!